DomainSherpa is where you learn all of the secrets of the domain name industry - directly from the Sherpas. What do successful domain name investors think when they value domain names? • Get your bids in soon for GoldenState.com, Yona.com, MegaMillions.com…• Plus, much more! We’re joined by David Clements, Shane Cultra & Andrew Rosener. In today’s episode we discuss a successful, profitable B2B company built in an emerging market, the cannabis market. Whether you have any interest in this particular vertical or not, cofounders Noel Abbot & Drew Rosener have taken a classic blueprint for startups in emerging markets and applied it brilliantly to this one. As the cannabis industry is now turning the corner as a serious and viable vertical, Ganjapreneur.com is years ahead of the curve! 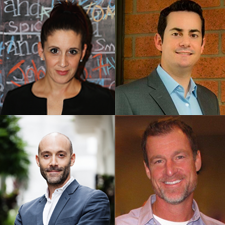 Hear these serial entrepreneurs’ thoughts on capitalizing in an industry that exclusively utilizes digital media, trust, brand consistency, and the enterprise value their domain name has brought their business. • Get your bids in soon for PureCoffee.com, VirtualCasino.com, Attm.com…• Plus, much more! We’re joined by Kate Buckley, Shane Cultra & Braden Pollock. NamesCon Domain Valuation Panel: What is My Domain Worth? Top global leaders in the domain name industry discuss domain valuation at NamesCon conference in January, 2019. Panelists Dave Evanson of SEDO, Andrew Rosener of MediaOptions, and Joe Styler of GoDaddy, and even GoDaddy’s AI, appraise domains in real time. Any domain name investor or company who plans to sell or acquire a domain in 2019 will benefit from today’s show. • Get your bids in soon for Countryside.com, FastFeet.com, Warehouses.com…• Plus, much more! We’re joined by Doron Vermaat, Jeff Gabriel & Andrew Rosener. Domain name brokers Andrew Rosener and Chris Zuiker discuss a distinct tipping point in how end users understand domain values and how this is causing a shift in supply and demand, and therefore in domain values. Given their daily conversations with top global decision-makers at end user corporations and startups, they see the market is also maturing to the point of many end users understanding the value of quality domain names. Hear how end-user perceptions of domain values are changing and the most common startup founders’ regrets they hear about – including how often an end user comes back to a broker wanting to acquire a domain they previously passed on! • Get your bids in soon for Unitar.com GetExtreme.com HowToBeGreat.com…• Plus, much more! We’re joined by Amanda Waltz, Shane Cultra & Andrew Rosener. On today’s show we examine what I believe is a historic development for the future of the domain industry. Jeff Sass joins us from Names.Club to discuss how their new financing model is impacting both domainers who want to invest and end users who want to pay for a domain, short term or long term, in a different fashion. Hear how this endeavor is expanding after 2 years, how you can invest smarter or buy more efficiently, and future predictions on the domain market. • Get your bids in soon for Mariachis.com, Shock.me, Chinese.restaurant…• Plus, much more! “It’s not what you know, it’s who you know.” But here’s a what you need to know: top global corporations need to know who to know! Hear how a top global corporation’s relationship with a domain name broker got them the one domain that had always been out of their reach, the domain that their brand always referred to, ICE. This multimillion dollar, three letter, one word .COM domain name went on the market for a matter of hours. ICE, owner of the NYSE, had always dreamed of owning it. Multiple offers were already on the table. A domain broker knew who to call at ICE to ensure they acquired the domain of their dreams. PLUS, utilizing an experienced domain name broker added value when it came to assuaging concerns with stock holders and the board!